Pyrex makes a durable 9 1/2" pie plate that is both decorative and functional. Great for deep dish pies and quiche. Included is my easy Corn Quiche recipe. If you are looking for a dual-duty dish, then this Pyrex Scalloped Pie Plate is a great buy. 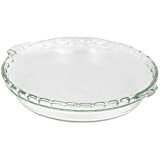 I do a lot of baking, and this Pyrex dish can handle the ingredients for quiche as well as handle baking deep dish pies such as apple and mincemeat. My corn quiche recipe is at the bottom of this review. A bonus is that not only does the pie plate cook well, but the scalloped design looks great on the table. I have owned the scalloped pie plates a long time, and the Pyrex stands up to use and wear. There are no chips, cracks, or scrapes in over five years of use. The top rim of these pie plates has a scallop design, and there are two handles, one on each side. The dish is one molded piece of Pyrex. When measuring the pie plate from handle to handle, the measurement is 11”. 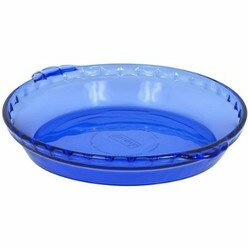 The pie plate has been issued in several colors: the clear and cobalt blue are lovely. Pyrex is known to evenly distribute heat through the thickness of the dish. Plus Pyrex does not hold odors or flavors of the food, and the dishes are designed not to stain. The pie plate can go in the refrigerator or freezer, microwave, convection, or traditional oven. Do not use it under a broiler or in a toaster oven. I mostly use this pie plate when cooking deep dish pies or quiche … and when I know the dish will be on the table for guests to see. The scallop edging and design are more decorative than my regular pie plates. These pie plates do well in my conventional oven, and I have also stored leftovers in the pie plates in the refrigerator. I have never taken the pie plate directly from the refrigerator and placed it in a hot oven since it is advised not to submit Pyrex to severe temperature changes. I have not had a reason to freeze anything in the Pyrex dish. Once in the oven, the Pyrex evenly cooks the dish contents. You will need potholders to remove the pie plate from the oven. The two molded Pyrex handles are easy to grab with potholders. When the dish is removed from the oven, I set it on a metal cooling rack. I let the dish cool a few minutes before slicing into the contents and serving. A great feature of these pie plates is that they don’t retain odors. I can cook an apple, mincemeat, or rhubarb pie and use the pie plate for a quiche that contains onions or tomato sauce. 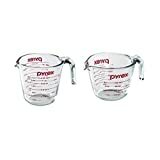 The Pyrex has never stained. I usually soak the cooled pie plate in the sink and then hand wash it using liquid soap, and then air dry the dish. The Pyrex pie plate is dishwasher safe and I do sometimes throw it in the dishwasher for cleaning. Mix together 1 1/2 cups crumbled crackers, vegetable oil, softened butter. Use mixture to line the bottom and sides of a 9 1/2" deep pie or quiche dish. Press the crumb mixture so that it is smooth. Put aside 1/2 cup of the crumbled cracker mixture to use as topping. In a large saucepan, melt the remaining 2 tablespoons of butter and saute the diced onion in the butter. Add the flour, stirring until combined. Pour in the milk and stir until the mixture thickens. Add in the celery salt and regular salt; stir. Gradually add beaten eggs to the saucepan. Add the corn kernels last and stir them into the mixture. Pour the saucepan’s contents into the pie plate which is already lined with the crumb mixture. Sprinkle the remaining 1/2 cup of crumb mixture atop the quiche. Bake in a 350-degrees F. oven for 35 minutes. Test doneness by inserting a long toothpick, cake tester, or knife in the center of the quiche. If the tester comes out clean, the quiche is done. Cut as you would a pie and serve hot. Makes 6-8 slices, depending upon the desired size of the wedges. The Pyrex 9 1/2" Scalloped Pie Plate works great for me. Not only is it decorative on the table, but it holds all the ingredients for one of my favorite quiche recipes. The pie plate is easy to clean and store, too. Love heart shaped cookie cutters are perfect for Valentine's Day, Wedding, Anniversary and Just to Say I Love You cookies! Sweet treats cut with press cutter are made with love. Whole doesn't love to eat great pizza but struggles with the idea of making one at home. Now with the right equipment you can turn out great pizza in your own kitchen.